Caught the Wanderlust bug? We sure have! If you’re raring to go, I have some exciting news for you! 1. Summer is almost here (I can hear the waves calling already), and 2. 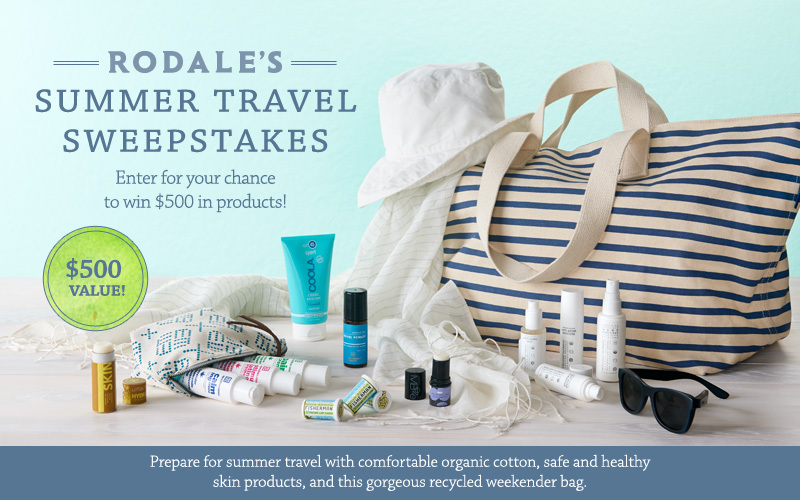 Rodale’s is running a summer travel sweepstakes! ENTER HERE for your chance to win $500 worth of ecofriendly summer travel gear! The prize includes a gorgeous Baggu weekender, made from recycled cotton (perfect for the beach!). It’s filled with some of our favorite organic skincare products and natural beach accessories that will have you traveling happily (and healthfully) all summer long. Don’t wait long! You only have until 11:59 p.m. on May 15 to enter. Good luck, and happy almost-summer! P.S. Do you have any fun summer travel plans? Let us know where you’ll be visiting in the comments. 7 Responses to Rodale’s Summer Travel Sweepstakes! Tried to enter contest but teliing me to enter address and there is no place to leave one. I am trying to enter, too. It’s asking for a street address…without a place for the info. What can rectify? Sorry about that! The link should be fixed now. Please let me know if you have anymore issues! Local trips planned for this summer — Granville, Ohio; German Village in Columbus; Worthington, Ohio Farmers Market (yes, it really is a destination!). Happy Summer! I’m discovering America, and discovering those places almost in my own backyard! Living in Colorful Colorado, I only have to drive anywhere I wish in any direction to see all the beauty I could ever want, without leaving Home!